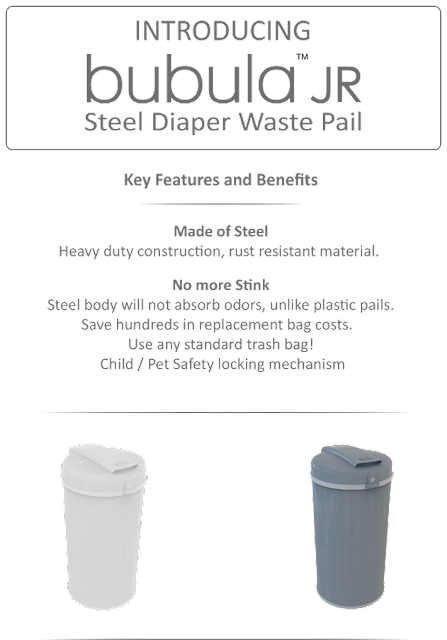 Living a Fit and Full Life: No More Stink with Bubula JR Steel Diaper Pail! We’re excited about the unique products that we’ve developed and look forward to finding new and innovative ways to delight our customers. We invite you to explore our latest products and discover a life with baby that’s easier, more comfortable and stylish. I absolutely in love with this Bubula JR Steel Diaper Pail! I've had 4 kids and have never used a diaper pail and boy should I have been. I've put up with stinky diapers in the kitchen trash can for far to long. I've been using the Bubula JR Steel Diaper Pail for a few weeks now and I cannot believe how well it contains sticky diapers as well as their smell. I also absolutely love the look and design of the Bubula JR Steel Diaper Pail. It goes with any decor and looks fabulous in my son nursery. The Bubula JR has a non skid bottom which is great because it stays put even when my little one tries to push it around the room. It includes a safety lock to keep little ones and pets from playing in it and uses standard size can liners. Another totally terrific thing about the Bubula JR Steel Diaper Pail is that someday when you're all done with diapers it converts to a regular trash can for long-term use in any room. The Bubula JR Steel Diaper Pail is awesome and I highly recommend it! Click HERE to find a store near you that sells Bubula! Click HERE to learn more about Bubula! Follow Bubula on social media!